Richland, MI (August 28, 2015) – World Equestrian Brands ambassadors Buck Davidson, Kim Severson, Allison Springer, and Allie Knowles left the Richland Park Horse Trials victorious this past weekend, winning three divisions and earning several other competitive placings. Buck Davidson and Ballynoe Castle RM, who were champions of the 2011 Adequan USEA Gold Cup CIC 3*, earned their second win in the same division at Richland Park this year. Despite competing with a few broken ribs from a fall during the competition just a few hours prior to his cross country trip, Davidson had an impressive cross country round on “Reggie,” as Ballynoe Castle RM is affectionately known. “My goal was just to get balanced and try to survive today,” laughed Davidson. “He looked after me. 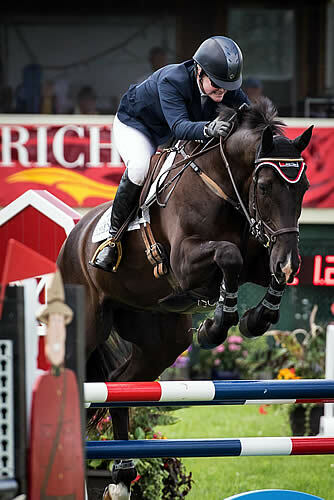 He is awesome, as all my horses are; I’m very proud of them.” The 15-year-old Irish Sport Horse, owned by Carl and Cassandra Segal, also jumped a clear round in the show jumping portion of the event, helping Davidson to clinch the win in the CIC 3* event. Kim Severson faced her own challenges in the advanced cross country portion of her ride. A mistake in the posted optimum time left her expecting a few time penalties. When she finished, she learned she was actually only a second over the optimum time, earning her and her ride – Cooley Cross Border – a win in the Advanced division. The single time fault in the cross country round as well as a clear round in the advanced show jumping put Severson in the obvious lead. Severson also took first place in the Open Preliminary division with Hope Cove, a 2001 Zangersheide owned by Michelle Parker. Severson has been riding Hope Cove since 2013. World Equestrian Brands is thrilled with the tremendous success of its ambassadors at the Richland Park Horse Trials. The company is proud to support these athletes and their horses with the highest quality brands of tack and equipment available on the market. The company’s first-class line of products includes saddles, bridles, girths, leg wraps, saddle pads, therapeutic equipment and more by Amerigo, Vespucci, E. A. Mattes, and Equilibrium. For more information about World Equestrian Brands and its products, visit www.worldequestrianbrands.com or call 1-888-637-8463.